For other ships with the same name, see USS Scorpion. Fate: Lost with a crew of 99 on 22 May 1968; cause of sinking unknown. Assigned to Submarine Squadron 6, Division 62, Scorpion departed New London, Connecticut, 24 August for a two-month European deployment. During that time, she participated in exercises with 6th Fleet units and NATO-member navies. After returning to New England in late October, she trained along the eastern seaboard until May 1961. On 9 August 1961, she returned to New London, moving to Norfolk, Virginia, a month later. In 1962, she earned a Navy Unit Commendation. Norfolk was Scorpion's port for the remainder of her career, and she specialized in developing nuclear submarine warfare tactics. Varying roles from hunter to hunted, she participated in exercises along the Atlantic coast, Bermuda and Puerto Rico operating areas. From June 1963 to May 1964, she interrupted operations for an overhaul at Charleston. She resumed duty in late spring, but was again interrupted from 4 August to 8 October for a transatlantic patrol. In the spring of 1965, she conducted a similar patrol in European waters. In 1966 she deployed for special operations. After completing those assignments, her commanding officer (CO) received a Navy Commendation Medal for outstanding leadership, foresight and professional skill. Other Scorpion officers and crewmen were also cited for meritorious achievement. Scorpion is reputed to have entered an inland Russian sea during a "Northern Run" in 1966, where it filmed a Soviet missile launch through its periscope before fleeing from Soviet Navy ships. On 1 February 1967, Scorpion entered Norfolk Naval Shipyard for needed refueling overhaul. However, instead of a much-needed complete overhaul, she received only emergency repairs to get quickly back on duty. The preferred SUBSAFE program required increased submarine overhaul times, from 9 months in length to 36 months. Intensive vetting of submarine component quality, SUBSAFE, was required, coupled with various improvements and intensified structural inspections – particularly, hull-welding inspections using ultrasonic testing – and reduced availability of critical parts like seawater piping. Cold War pressures prompted U.S. Submarine Force Atlantic (SUBLANT) officers to seek ways to cut corners. The last overhaul cost one-seventh of those performed on other nuclear submarines at the same time. This was the result of concerns about the "high percentage of time offline" for nuclear attack submarines, estimated at about 40% of total available duty time. Scorpion's original "full overhaul" was reduced in scope. Long-overdue SUBSAFE work, such as a new central valve control system, was not performed. Crucially, her emergency system was not corrected for the same problems that destroyed Thresher. While Charleston Naval Ship Yard claimed the Emergency Main Ballast Tank Blow (EMBT) system worked as-is, SUBLANT claimed it did not, and their EMBT was "tagged out" or listed as unusable. Perceived problems with overhaul duration led to a delay on all SUBSAFE work in 1967. CNO Admiral David Lamar McDonald approved Scorpion's reduced overhaul on 17 June 1966. On 20 July, McDonald deferred SUBSAFE extensions, otherwise deemed essential since 1963. [verification needed]. Tallahatchie County with Scorpion alongside, outside Claywall Harbor, Naples, Italy, in April 1968 (shortly before Scorpion departed on her last voyage). This is believed to be one of the last photographs taken of Scorpion. In late October 1967, Scorpion started refresher training and weapons system acceptance tests, and was given a new commanding officer, Francis Slattery. Following type training out of Norfolk, Virginia, she got underway on 15 February 1968 for a Mediterranean Sea deployment. She operated with the 6th Fleet into May and then headed west for home. Scorpion suffered several mechanical malfunctions, including a chronic problem with Freon leakage from refrigeration systems. An electrical fire occurred in an escape trunk when a water leak shorted out a shore power connection? There is no evidence that Scorpion's speed was restricted in May 1968, although it was conservatively observing a depth limitation of 500 feet (150 m), due to the incomplete implementation of planned post-Thresher safety checks and modifications. Departing the Mediterranean on 16 May, two men left Scorpion at Naval Station Rota in Spain, one for a family emergency (RM2 Eric Reid) and the other (ICS Joseph Underwood) was dispatched for health reasons. Some U.S. ballistic missile submarines (SSBNs) operated from the U.S. Naval base Rota. It is speculated that USS Scorpion provided noise cover for USS John C. Calhoun as they both departed to the Atlantic the first time. As well as Soviet intelligence trawlers, there were Soviet fast nuclear attack submarines attempting to detect and follow the U.S. submarines going out of Rota; in this case, two fast 32-knot Soviet November-class hunter-killer subs. Scorpion was then detailed to observe Soviet naval activities in the Atlantic in the vicinity of the Azores. An Echo II-class submarine was operating with this Soviet task force, as well as a Russian guided missile destroyer. Having observed and listened to the Soviet units, Scorpion prepared to head back to Naval Station Norfolk. For an unusually long period, beginning shortly before midnight on 20 May and ending after midnight 21 May, Scorpion attempted to send radio traffic to Naval Station Rota, but was only able to reach a Navy communications station in Nea Makri, Greece, which forwarded Scorpion's messages to COMSUBLANT. Lt. John Roberts was handed Commander Slattery's last message, that he was closing on the Soviet submarine and research group, running at a steady 15 kn (17 mph; 28 km/h) at a depth of 350 ft (110 m) "to begin surveillance of the Soviets". Six days later the media reported she was overdue at Norfolk. Some reports indicate that a large and secret search was launched three days before Scorpion was expected back from patrol. This, combined with other declassified information, led to speculation that the U.S. Navy knew of Scorpion's destruction before the public search was launched. At the end of October 1968, the Navy's oceanographic research ship Mizar located sections of the hull of Scorpion on the seabed, about 400 nmi (740 km) southwest of the Azores, under more than 9,800 ft (3,000 m) of water. This was after the Navy had released sound tapes from its underwater "SOSUS" listening system, which contained the sounds of the destruction of Scorpion. The court of inquiry was subsequently reconvened, and other vessels, including the bathyscaphe Trieste II, were dispatched to the scene, collecting many pictures and other data. Although Craven received much credit for locating the wreckage of Scorpion, Gordon Hamilton, an acoustics expert who pioneered the use of hydroacoustics to pinpoint Polaris missile splashdown locations, was instrumental in defining a compact "search box" wherein the wreck was ultimately found. Hamilton had established a listening station in the Canary Islands that obtained a clear signal of what some scientists believe was the noise of the vessel's pressure hull imploding as she passed crush depth. A Naval Research Laboratory scientist named Chester "Buck" Buchanan, using a towed camera sled of his own design aboard Mizar, finally located Scorpion. The towed camera sled, which was fabricated by J. L. "Jac" Hamm of Naval Research Laboratory's Engineering Services Division, is housed in the National Museum of the United States Navy. Buchanan had located the wrecked hull of Thresher in 1964 using this technique. The bow of Scorpion appears to have skidded upon impact with the globigerina ooze on the sea floor, digging a sizable trench. The sail had been dislodged, as the hull of the operations compartment upon which it perched disintegrated, and was lying on its port side. One of Scorpion's running lights was in the open position, as if it had been on the surface at the time of the mishap, although it may have been left in the open position during the vessel's recent nighttime stop at Rota. One Trieste II pilot who dived on Scorpion said that the shock of the implosion may have knocked the light into the open position. The secondary Navy investigation – using extensive photographic, video, and eyewitness inspections of the wreckage in 1969 – suggested that Scorpion's hull was crushed by implosion forces as it sank below crush depth. The Structural Analysis Group, which included Naval Ship Systems Command's Submarine Structures director Peter Palermo, plainly saw that the torpedo room was intact, though it had been pinched by excessive sea pressure. The operations compartment collapsed at frame 33, this being the king frame of the hull, reaching its structural limit first. The conical/cylindrical transition piece at frame 67 followed instantly. The boat was broken in two by massive hydrostatic pressure at an estimated depth of 1,530 feet (470 m). The operations compartment was largely obliterated by sea pressure, and the engine room had telescoped 50 ft (15 m) forward into the hull due to collapse pressure, when the cone-to-cylinder transition junction failed between the auxiliary machine space and the engine room. The sail was ripped off, as the hull beneath it folded inward. The propulsion shaft came out of the boat; the engineering section had collapsed inward in a telescoping fashion. The broken boat fell another 9,000 feet (2,700 m) to the ocean floor. Photos taken in 1986 by Woods Hole Alvin, released by Navy in 2012, shows the broken inboard end of the propulsion shaft. Shortly after her sinking, the Navy assembled a Court of Inquiry to investigate the incident and to publish a report regarding the likely causes for the sinking. The court was presided over by Vice Admiral Bernard L. Austin, who had presided over the inquiry into the loss of Thresher. The report's findings were first made public on January 31, 1969. While ruling out sabotage, the report said: "The certain cause of the loss of the Scorpion cannot be ascertained from evidence now available." In 1984, the Norfolk Virginian-Pilot and The Ledger-Star obtained documents related to the inquiry and reported that the likely cause of the disaster was the detonation of a torpedo while the Scorpion's own crew attempted to disarm it. The U.S. Navy declassified many of the inquiry's documents in 1993. An extensive, year-long analysis of Gordon Hamilton's hydroacoustic signals of the submarine's demise was conducted by Robert Price, Ermine (Meri) Christian and Peter Sherman of the Naval Ordnance Laboratory (NOL). All three physicists were experts on undersea explosions, their sound signatures, and their destructive effects. Price was also an open critic of Craven. Their opinion, presented to the Navy as part of the Phase II investigation, was that the death noises likely occurred at 2,000 ft (610 m) when the hull failed. Fragments then continued in a free fall for another 9,000 ft (2,700 m). This appears to differ from conclusions drawn by Craven and Hamilton, who pursued an independent set of experiments as part of the same Phase II probe, demonstrating that alternate interpretations of the hydroacoustic signals were possibly based on the submarine's depth at the time it was stricken and other operational conditions. The Structural Analysis Group (SAG) concluded that an explosive event was unlikely and was highly dismissive of Craven and Hamilton's tests. The SAG physicists argued that the absence of a bubble pulse, which invariably occurs in an underwater explosion, is absolute evidence that no torpedo explosion occurred outside or inside the hull. Craven had attempted to prove that Scorpion's hull could "swallow" the bubble pulse of a torpedo detonation by having Gordon Hamilton detonate small charges next to air-filled steel containers. The 1970 Naval Ordnance Laboratory "Letter", the acoustics study of Scorpion destruction sounds by Price and Christian, was a supporting study within the SAG report. In its conclusions and recommendations section, the NOL acoustic study states: "The first SCORPION acoustic event was not caused by a large explosion, either internal or external to the hull. The probable depth of occurrence ... and the spectral characteristics of the signal support this. In fact, it is unlikely that any of the Scorpion acoustic events were caused by explosions." Bow section of the Scorpion contains two nuclear Mark 45 anti-submarine torpedoes. U.S. Navy photo. A 1985 image of the submarine's fractured stern section. The remains of the Scorpion are reportedly resting on a sandy seabed at 32°54.9′N 33°08.89′W﻿ / ﻿32.9150°N 33.14817°W﻿ / 32.9150; -33.14817 in the North Atlantic Ocean. The wreck lies at a depth of 3,000 m (9,800 ft) approximately 400 nmi (740 km) southwest of the Azores on the eastern edge of the Sargasso Sea. The U.S. Navy periodically visits the site to determine whether wreckage has been disturbed and conduct testing for the release of any fissile materials from the submarine's nuclear reactor or two nuclear weapons. Except for a few photographs taken by deep water submersibles in 1968 and 1985, the U.S. Navy has never made public any physical surveys it has conducted on the wreck. The last photos were taken by Robert Ballard and a team of oceanographers from Woods Hole using the submersible in 1985. The U.S. Navy secretly loaned Ballard the submersible to visit the wreck sites of the Thresher and Scorpion. In exchange for his work, the U.S. Navy then allowed Ballard, a USNR officer, to use the same submersible to search for RMS Titanic. Due to the radioactive nature of the Scorpion wreck site, the U.S. Navy has had to publish what specific environmental sampling it has done of the sediment, water, and marine life around the sunken submarine to establish what impact it has had on the deep-ocean environment. The information is contained within an annual public report on its environmental monitoring for all U.S. nuclear-powered ships and boats. The reports explains the methodology for conducting deep-sea monitoring from both surface vessels and submersibles. These reports say the lack of radioactivity outside the wreck shows the nuclear fuel aboard the submarine remains intact and no uranium in excess of levels expected from the fallout from past atmospheric testing of nuclear weapons has been detected during Naval inspections. Likewise the two nuclear-tipped Mark 45 anti-submarine torpedoes (ASTOR) that were lost when the Scorpion sank show no signs of instability. It is likely the plutonium and uranium cores of these weapons corroded to a heavy, insoluble material soon after the sinking. The material remain at or close to their original location inside the boat's torpedo room. If the corroded materials were released outside the submarine, their density and insolubility would cause them to settle into the sediment. In November 2012, the U.S. Submarine Veterans, an organization with over 13,800 members, asked the U.S. Navy to reopen the investigation on the sinking of USS Scorpion. The Navy denied approval to reopen the investigation of the cause. A private group including family members of the lost submariners stated they would investigate the wreckage on their own since it was located in international waters. A hydrogen explosion as the proximal cause for the loss of Scorpion is assessed and analyzed by retired acoustics expert Bruce Rule, a long-time analyst for the Integrated Undersea Surveillance System (IUSS), in his IUSS alumni association blog. Based on his own experiences, Rear Admiral Dave Oliver, who served in both diesel boats and nuclear submarines, provides his assessment in his book Against the Tide that Scorpion was lost as a result of hydrogen build-up due to changes in the ventilation lineup while proceeding to periscope depth. Most recently, following analysis of the ship's battery cells, this is the leading theory for the loss of Scorpion. The U.S. Navy's court of inquiry listed as one possibility the inadvertent activation of a battery-powered Mark 37 torpedo by stray voltage. This acoustic homing torpedo, in a fully ready condition and without a propeller guard, is theorized by some to have started running within the tube. Released from the tube, the torpedo then somehow became fully armed and successfully engaged its nearest target: Scorpion. A later theory was that a torpedo may have exploded in the tube, caused by an uncontrollable fire in the torpedo room. The book Blind Man's Bluff documents findings and investigation by Dr. John Craven, who surmised that a likely cause could have been the overheating of a faulty battery. The Mark 46 silver–zinc battery used in the Mark 37 torpedo had a tendency to overheat, and in extreme cases could cause a fire that was strong enough to cause a low-order detonation of the warhead. If such a detonation had occurred, it might have opened the boat's large torpedo-loading hatch and caused Scorpion to flood and sink. However, while Mark 46 batteries have been known to generate so much heat that the torpedo casings blistered, none is known to have damaged a boat or caused an explosion. Dr. John Craven mentions that he did not work on the Mark 37 torpedo's propulsion system and only became aware of the possibility of a battery explosion twenty years after the loss of Scorpion. In his book The Silent War, he recounts running a simulation with former Scorpion executive officer Lieutenant Commander Robert Fountain, Jr. commanding the simulator. Fountain was told he was headed home at 18 knots (33 km/h) at a depth of his choice, then there was an alarm of "hot running torpedo". Fountain responded with "right full rudder", a quick turn that would activate a safety device and keep the torpedo from arming. Then an explosion in the torpedo room was introduced into the simulation. Fountain ordered emergency procedures to surface the boat, stated Dr. Craven, "but instead she continued to plummet, reaching collapse depth and imploding in ninety seconds – one second shy of the acoustic record of the actual event." Craven, who was the Chief Scientist of the Navy's Special Projects Office, which had management responsibility for the design, development, construction, operational test and evaluation and maintenance of the UGM-27 Polaris Fleet Missile System had long believed Scorpion was struck by her own torpedo, but revised his views during the mid-1990s when he learned that engineers testing Mark 46 batteries at Keyport, Washington just before the Scorpion's loss, said the batteries leaked electrolyte and sometimes burned while outside their casings during lifetime shock, heat and cold testing. Although the battery manufacturer was accused of building bad batteries, it was later able to successfully prove its batteries were no more prone to failure than those made by other manufacturers. Twenty years later, Craven learned that the sub could have been destroyed by a "hot-running torpedo." Other subs in the fleet had replaced their defective torpedo batteries, but the Navy wanted Scorpion to complete its mission first. If Scorpion had fired a defective torpedo, it could have missed its target and turned back to strike the sub that launched it. Ed Offley's book Scorpion Down promotes a hypothesis suggesting that the Scorpion was sunk by a Soviet submarine during a standoff that started days before 22 May. Offley also cites that it occurred roughly at the time of the submarine's intelligence-gathering mission, from which she was redirected from her original heading for home; according to Offley, the flotilla had just been harassed by another U.S. submarine, USS Haddo. W. Craig Reed, who served on Haddo a decade later as a petty officer and diver, and whose father was a U.S. Navy officer responsible in significant Electronic Support Measures (ESM) advances in sub detection in the early 1960s, recounted similar scenarios to Offley in Red November, over Soviet torpedoing of Scorpion and details his own service on USS Haddo in 1977 running inside Soviet waters off Vladivostok, when torpedoes appeared to have been fired at Haddo, but were immediately put down by the captain as a Soviet torpedo exercise. Both All Hands Down and Scorpion Down point toward involvement by the KGB spy-ring (the so-called Walker Spy-Ring) led by John Anthony Walker, Jr. in the heart of the U.S. Navy's communications, stating that it could have known that Scorpion was coming to investigate the Soviet flotilla. According to this theory, both navies agreed to hide the truth about both incidents. [clarification needed] Several U.S. Navy submarines collided with Soviet Echo-class subs in Russian and Scottish waters in this period. [clarification needed] Commander Roger Lane Nott, Royal Navy commander of HMS Splendid during the 1982 Falklands War, stated that in 1972, during his service as a junior navigation officer on HMS Conqueror, a Soviet submarine entered the Scottish Clyde channel and Conqueror was given the order to "chase it out". Having realized it was being pursued, "a very aggressive Soviet Captain turned his submarine and drove it straight at HMS Conqueror. It had been an extremely close call." According to a translated article from Pravda, Moscow never issued a "fire" command during the Cold War. This is disputed by Royal Navy officers, "there had been other occasions when harassed Russians had fired torpedoes to scare off trails". The Navy court of inquiry official statement was that there was not another ship within 200 miles of Scorpion at the time of the sinking. Adding to the body of evidence against a Soviet torpedo-attack theory, U.S. Navy submarine Captain Robert LaGassa has flatly stated that "no Soviet Submarine in 1968 could detect, track, approach and attack any Skipjack or later class U.S. submarine". Released in 2006, Stephen Johnson's Silent Steel: The Mysterious Death of the Nuclear Attack Sub USS Scorpion provides a meticulously detailed listing of every mechanical problem on the submarine cited by the Navy or mentioned in crewmen's letters, but does not solve the Scorpion's sinking. Johnson, a critic of Dr. Craven, agrees with Navy scientists who, in 1970, gave their opinion that the sub's hull was smashed by implosion damage and not a torpedo blast, a finding they support with their interpretation of certain evidence about the condition of the hull and hydroacoustic recordings of the disaster. Silent Steel portrays an overworked submarine denied needed maintenance and manned by a demoralized crew, a depiction contradicted by many former Scorpion enlisted men and officers, and based in part on the testimony of sailors who had applied for transfer from the boat. Johnson also enumerates many of the Navy-wide submarine maintenance issues that denied Scorpion an overhaul and overdue safety improvements, though the Navy would maintain that virtually all necessary and vital improvements and repairs were made on the submarine before her final deployment. 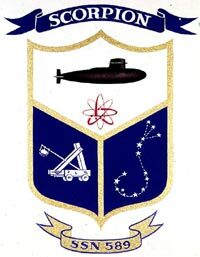 The Submarine Safety Program, initiated following the 1963 loss of Thresher, delayed new submarine construction and sub overhauls by monopolizing skilled workers and critical spare parts. Fearing that a normal overhaul and safety work during 1967 might sideline Scorpion for three years, it was selected for a brief experimental overhaul, but this was canceled due to a shortage of workers. Scorpion sank eight months after leaving Norfolk Naval Shipyard. In 2005, the book Red Star Rogue: The Untold Story of a Soviet Submarine's Nuclear Strike Attempt on the U.S., by former American submariner Kenneth Sewell in collaboration with journalist Clint Richmond, claimed that Soviet submarine K-129 was sunk 300 nmi (560 km) northwest of Oahu on 7 March 1968 while attempting to launch her three ballistic missiles, in a rogue attempt to destroy Pearl Harbor. Sewell claims that the sinking of Scorpion was caused by a retaliatory strike for the sinking of K-129, which the Soviets had attributed to a collision with USS Swordfish. In 1995, when Peter Huchthausen began work on a book about the Soviet underwater fleet, he interviewed former Soviet Admiral Victor Dygalo, who stated that the true history of K-129 has not been revealed because of the informal agreement between the two countries' senior naval commands. The purpose of that secrecy, he alleged, is to stop any further research into the losses of either Scorpion or K-129. Huchthausen states that Dygalo told him to "forget about ever resolving these sad issues for the surviving families." All Hands Down was written by Kenneth R. Sewell, a nuclear engineer and a U.S. Navy veteran who spent five years aboard Parche, a fast attack submarine. It attempts to link the sinking of Scorpion with the Pueblo incident, the John Anthony Walker spy ring, and Cold War Soviet aggression. The thesis of this book is that action off the Canary Islands was the direct cause of the sinking. The author purports that this is supported by motives in the Soviet Navy following the sinking of K-129, which caused the Russian Navy to trap a U.S. submarine. The bait for this trap would be strange military operations and furtive naval manoeuvres in the Atlantic, accompanied by countermeasures that would only seemingly be defeated by the deployment of a nuclear submarine. With information from spying by Walker, the position and arrival time of Scorpion was known by the Russians, and its sinking followed the springing of the trap. The book claims Scorpion was sunk by a Ka-25 helicopter equipped with anti-submarine torpedoes, which took off from one ship and landed on a different one. This was so that no one, other than the aircrew of the helicopter, would notice one torpedo missing. The book then purports a cover-up by American and Soviet officials, to avoid public outrage and an increase in Cold War tension. Ed Offley, a reporter on military affairs, has closely followed developments in information concerning the sinking of the Scorpion. His most recent article on the subject is "Buried at Sea" published in the Winter 2008 issue of the Quarterly Journal of Military History. This article summarizes the facts in the case as presented in his 2007 book Scorpion Down: Sunk by the Soviets, Buried by the Pentagon: The Untold Story of the USS Scorpion. In the book Offley, gathering decades of his own research, hypothesizes that Scorpion was sunk by the Soviets, possibly in retaliation for the loss of K-129 earlier that year. The book paints a picture of increasing Soviet anger at U.S. Navy provocations — specifically, close-in monitoring of Soviet naval operations by almost every U.S. nuclear submarine. At approximately the same time, the Soviet intelligence community scored a huge boon in receiving the mechanical cryptologic devices from Pueblo. These machines, combined with daily crypto keys from the John Anthony Walker spy ring, likely allowed the Soviets to monitor in real time U.S. Navy ship dispositions and communications. Offley contends that the Scorpion was tracked by several Soviet Navy assets from the Mediterranean to its final operational area south of the Azores, where it was then sunk by a Soviet torpedo. He claims the U.S. Navy was aware of the loss of the Scorpion on 21 May 1968 and engaged in a massive cover-up, within days destroying much of the sound and communication data at SOSUS ground stations in the U.S. and Europe, and delaying any public indication of the loss until its scheduled arrival at Norfolk, Virginia five days later, partly to disguise the fact that U.S. nuclear subs were in constant or frequent communication with U.S. Naval Communication bases and that the subsequent search for the Scorpion was a five months-long deception to pretend they had no idea of the location of the hull. The oral testimony relied upon by Offley are recountings of surviving SOSUS recordings documenting torpedo sounds, evasion sounds, an explosion, and eventually the sounds of implosions as Scorpion plunged past crush depth. In a section from this 2014 book titled "The Danger of Culture," retired U.S. Navy Rear Admiral Dave Oliver offers the theory based on his own experiences that it was possibly a hydrogen explosion, either during or immediately following a battery charge, that destroyed USS Scorpion and killed her crew. The proximate cause in that scenario would have been the procedural carryover from diesel boat days wherein the boat was effectively rigged for collision—with subsequent changes in ventilation flow and watertight condition—before proceeding to periscope depth by way of setting "Condition Baker." Oliver had personally witnessed dangerously high percent-hydrogen spikes under such conditions aboard a nuclear submarine, specifically while going to periscope depth and setting Condition Baker during a battery charge. Diesel boats, on the other hand, were not capable of doing a battery charge while deeply submerged, but were instead dealing with the risk of collision while on anti-surface ship operations when proceeding to periscope depth while in or near shipping lanes. In regard to NAVSEA responsibility, he further states: "I always felt that the investigators closed their eyes to the most likely cause because they did not want to acknowledge their own involvement in this tragedy. I had forwarded my letter about Condition Baker via some of the same people responsible for the Scorpion investigation." The assessment of a hydrogen explosion as the proximal cause for the loss of Scorpion is further assessed and analyzed by retired acoustics expert Bruce Rule, a long-time analyst for the Integrated Undersea Surveillance System (IUSS), who covers this in substantial detail on the IUSS alumni association blog. Phil Ochs released a song on his album Rehearsals for Retirement (1969) titled "The Scorpion Departs But Never Returns". 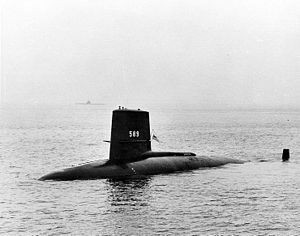 ^ a b c d "USS Scorpion (SSN 589) May 27, 1968 – 99 Men Lost". United States Navy. 2007. Archived from the original on 12 March 2008. Retrieved 9 April 2008. ^ CINCLANTFLEET History Log June 1968 to July 1969, page 104 at 4. a. ^ a b Sontag & Drew (2000), p. 432. ^ "Submarine Safety Program (SUBSAFE)". Electric Boat Corporation. Archived from the original on 28 May 2015. Retrieved 23 February 2019. ^ "Procedures for Qualification and Authorization of Activities to Perform SUBSAFE Work" (PDF). NAVSEA. 6 November 2006. Archived from the original (PDF) on 28 February 2013. Retrieved 23 February 2019. ^ a b c d e Sewell & Preisler (2008). ^ a b Offley (2007). ^ Bradley, Mark A. (July 1998). "Why they called the Scorpion 'Scrapiron'". Proceedings. Annapolis: United States Naval Institute. 124: 30–38. (Subscription required (help)). ^ Keyser, Tom (21 November 1993). "After 25 years of loss, families resent Navy's silence about sub". Baltimore Sun. Archived from the original on 14 December 2014. Retrieved 7 January 2014. ^ Offley (2007), pp. 241–. ^ a b "Strange Devices That Found the Sunken Sub Scorpion". Popular Science. Bonnier Corporation. April 1969. pp. 66–71. ISSN 0161-7370. Retrieved 23 February 2019. ^ "Loss of Scorpion Baffles Inquiry". The New York Times. February 1, 1969. pp. 1, 14. ^ "Navy Indicates Cause Of 1968 Sub Sinking". The New York Times. United Press International. December 17, 1984. Retrieved May 22, 2017. ^ Wiltrout, Kate (May 18, 2008). "New evidence suggests Soviets may have sunk the sub Scorpion 40 years ago". The Virginian-Pilot. Archived from the original on 21 May 2016. Retrieved May 22, 2017. ^ a b c Potts, J. R. "Our continuation of the USS Scorpion (SSN-589) Nuclear Attack Submarine story". Military Factory. Retrieved 17 August 2014. ^ Command History of the Commander in Chief U.S. Atlantic Fleet, OPNAV REPORT 5750-1, July 1968 – June 1969, p. 104 at 4. a. ^ Vergano, Dan (16 November 2012). "Submarine vets call for USS Scorpion investigation". USA Today. Retrieved 17 March 2014. ^ "The Commentaries of Bruce Rule". IUSSCAA.org. Retrieved 23 February 2019. ^ Oliver, Dave (August 2015). "Respect For Authority — Overrated?" (PDF). The Submarine Review: 116–124. Archived from the original (PDF) on 31 May 2017. Retrieved 19 January 2018. ^ Friedman, Norman (1994). U.S. Submarines Since 1945: An Illustrated Design History. U.S. Naval Institute. pp. 20–21. ISBN 1-55750-260-9. ^ Johnson, Stephen (2006). Silent Steel: The Mysterious Death of the Nuclear Attack Sub USS Scorpion. Hoboken, NJ: John Wiley & Sons. p. 304. ISBN 978-0-47126-737-9. ^ McGrayne, Sharon (2011). The Theory That Would Not Die: How Bayes' Rule Cracked the Enigma Code, Hunted Down Russian Submarines & Emerged Triumphant from Two Centuries of Controversy. New Haven & London: Yale University Press. p. 203. ISBN 978-0-30016-969-0. ^ Johnson, Stephen (23 May 1993). "A long and deep mystery/Scorpion crewman says sub's '68 sinking was preventable". Houston Chronicle. Hearst Corporation. Archived from the original on 8 February 2009. Retrieved 27 June 2008. ^ Sewell & Preisler (2008), p. 288. ^ Offley (2007), pp. 480. ^ Reed, W.C. (2010). Red November: Inside the Secret U.S.-Soviet Submarine War. New York: William Morrow. pp. 212–24, 287–90. ISBN 978-0-06180-676-6. ^ a b White (2006), p. 39. ^ "Has the "Fire!" Command Sounded in the Compartments of the Cold War?". Pravda – via RusNavy.com. ^ "Court of Inquiry – USS Scorpion" (PDF). JAG Navy Military. JAG Navy Library Investigations. 5 November 1968. Finding of Fact #49-53. ^ Rule, Bruce (20 January 2014). "Assessment of Why Scorpion Was Lost by an Exceptionally Qualified Submarine Officer". IUSSCAA.org. Retrieved 23 February 2019. ^ Johnson, Stephen (6 January 2006). Silent Steel: The Mysterious Death of the Nuclear Attack Sub USS Scorpion. Wiley. ISBN 0471267376. ^ Sontag & Drew (2000). ^ Sewell, Kenneth; Richmond, Clint (2006). Red Star Rogue: The Untold Story of a Soviet Submarine's Nuclear Strike Attempt on the U.S. New York: Pocket Star. ISBN 978-1-41652-733-6. ^ Offley, Ed (21 May 1998). "Navy says sinking of the Scorpion was an accident; revelations suggest a darker scenario". Seattle Post-Intelligencer. Retrieved 9 February 2008. ^ Offley, Ed (2008). "Buried at Sea". MHQ: The Quarterly Journal of Military History. 20 (2): 8–16. ^ Oliver, Dave (2014). Against the Tide. Annapolis, MD: Naval Institute Press. p. 43. ISBN 1612517978. Offley, Ed (2007). Scorpion Down: Sunk by the Soviets, Buried by the Pentagon: The Untold Story of the USS Scorpion. New York: Perseus Books Group. ISBN 978-0-465-00884-1. Sewell, Kenneth; Preisler, Jerome (2008). All Hands Down: The True Story of the Soviet Attack on the USS Scorpion. New York: Simon & Schuster. ISBN 978-1-43910-454-5. Sontag, Sherry; Drew, Christopher (2000). Blind Man's Bluff: The Untold Story of American Submarine Espionage. New York: Harper Paperbacks. ISBN 978-0-06097-771-9. White, Rowland (2006). Vulcan 607. London: Bantam Press. ISBN 978-0-59305-391-1. Love, Robert W. History of the U.S. Navy, Vol. 2, 1942–1991 (October 1992 ed.). Stackpole Books. p. 912. ISBN 0-8117-1863-8. Rule, Bruce. Why the USS Scorpion (SSN 589) Was Lost: The Death of a Submarine in the North Atlantic (31 October 2011 ed.). Nimble Books LLC. p. 74. ISBN 1608881202. Rule, Bruce (22 September 2013). "Rebutting Conjecture: Scorpion Reversed Course Just Before Being Lost". IUSSCAA.org. Wikimedia Commons has media related to USS Scorpion (SSN-589).